A uniquely moving and disturbing picture, Soul uses surreal cinematic poetry to postulate schizophrenia as a dissociation of the spirit. Taiwan's Chung Mong-Hong (The Fourth Portrait) is an accomplished visionary capable of balancing a calculated use of technical ability with instinctual artistry, as demonstrated throughout this emotionally gripping and consistently stimulating film. 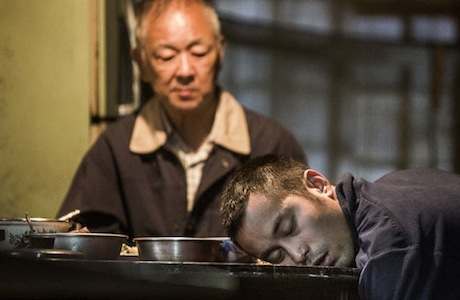 Soft cut like the slow blink of an eyelid in hypnotic rhythm, the opening scene of a sushi chef collapsing while filleting a live fish is as meditative as it is disquieting. Always with a reason and never going to excess, Chung uses heavily askew camera angles as part of his aesthetic, effectively conveying that some fundamental elemental of existence is out of whack. Showing that his world has literally been turned upside down, our fainting chef wakes up on his back with the camera locked to his perspective: gently bouncing trees stabbing down at the sky. His co-workers are driving him to his father's remote mountainside orchid plantation to recuperate from his unexplained episode. There, almost entirely despondent at first, A-Chaun (Joseph Chang) is cared for by his sister and nearing decrepitude yet still spry father, Wang (Jimmy Wong). Unresolved family issues bubble around the edges of their inquiries into A-Chaun's mental state, but Wang, in particular, exhibits unconditional love and acceptance that are quite touching. However, all is not roses. A-Chaun's sister grows wary of the increasingly unnerving changes in her brother, while Wang's moral compass is clouded by a parent's commitment to his child. The situation gradually mushrooms out of control as it becomes clear that A-Chaun has either had some form of mental break or is subletting his body to a malicious wandering spirit. To signify the possibility of energy emanations that some consider evidence of the soul, in many shots, characters bloom with natural ephemeral emissions, like steam rising from A-Chaun's warm body in the cold rain. This sort of artfully embedded symbolism gains purchase throughout the film. It's not just image-based artistry Soul is brimming with either; subtle sound effects, like the perpetual low howl of wind, contribute to the overall nightmarish quality tainting the picture's beauty. Adding to the near-perfection of this sure to be under-seen work of uncommon acuity, the score by Tseng Szu-Ming, which places a haunting string arrangement atop an entrancing murmur of reverse electronics, is as phenomenal as every other component of Chung's intricate and affecting Soul.